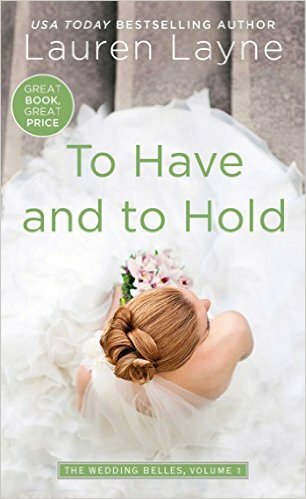 To Have and to Hold is the first full installment of Lauren Layne’s “Wedding Belles” series, focusing on a high-end wedding planning company in Manhattan. This kickoff focuses on Seth and Brooke and was delightful from beginning to end. Seth enters our story as the brother of a Wedding Belles bride, while Brooke is their newest employee. Seth’s been asked by his sister, Maya, to help with the planning (as he’s paying for everything!) and Brooke’s been tasked with keeping his ornery self in line. Some complications include Brooke’s most recent ex-boyfriend, Seth’s suspicions that Maya’s fiancee is a cretin, and the sexual chemistry that crackles between Seth and Brooke. Read below for an excerpt of the book, to get a feel for the writing and the characters. If you’re someone who likes contemporary romances, then I’d highly recommend this one. I inhaled it and cannot wait for the next installment! It’s not as though Brooke had meant to start dating a con man. She certainly didn’t intend to get engaged to one. But that’s the thing about con mans. The good ones were good at, well . . . the con. And Clay Battaglia had been a good one. The best, actually, if you took the word of the FBI agent who’d debriefed Brooke and her family—while she was still in her wedding dress. Just moments after Brooke kissed her father’s cheek and prepared to marry the man she loved at the wedding she’d poured her heart into, the FBI stormed—yes, stormed—the church. Clay was in handcuffs before she even registered what was happening. Numbly she watched as he listened to his Miranda rights at the precise moment he should have been listening to the vows she’d spent months writing. No, the man she’d loved for two years with every fiber of her being merely smiled at her and then shrugged. There’d been plenty of photos taken that day, but that was the one that made it onto the front page of every major newspaper on the West Coast. “The Greatest Con of All.” “Arrested by Love.” And her personal favorite, courtesy of her very own LA Times: “White-Collar Bride.” The stories all read pretty much like you’d expect. About Clay, mostly, and the litany of accusations against him, but also about Brooke. None of that had bothered her. What had bothered her was that she’d been a fool. Self absorbed, naive, and downright blind. Brooke had been dodging dumb-blonde jokes for most of her life, but the debacle with Clay was the first time she thought she might really, truly be deserving of the title. She hadn’t been surprised when new clients had stopped calling. Hadn’t been surprised when current clients canceled. Nobody wanted to hire that wedding planner. Brooke had even been relieved, at first. In those first weeks after Clay’s arrest, she hadn’t been able to handle any talk of weddings. Not her own, and not other people’s. She’d imagined that all their nights would be like that. All the nights for the rest of her life, with maybe with a couple of kids thrown into the mix eventually. Brooke swallowed. There wouldn’t be any more nights on the patio watching the sunset with Clay. Wouldn’t be any patio at all, because Brooke’s real estate broker had made it quite clear that she should be counting herself lucky to get a dishwasher in New York—a patio was out of the question. I enjoyed this one with a glass of iced cold Diet Coke, and generally ignored the world while I finished it. If the idea of white collar criminals intrigues you, have you seen USA’s show White Collar? Starring Matt Bomer as the suave criminal Neil Caffrey, the series is delightful viewing. I received a complimentary copy of this book from Tasty Book Tours in exchange for a honest review and participation in the tour. Thanks, guys! Contemporary, Diet Coke, Romance, Series, U.S.